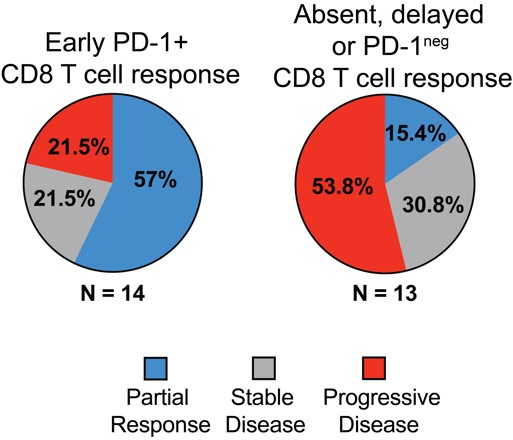 The study supports a straightforward idea: if CD8 T cells in lung cancer patients appear to respond to immunotherapy, that’s a good sign. Larger studies to confirm are underway. Monitoring the immune response could potentially help oncologists and patients decide, within just a few weeks of starting immunotherapy drugs, whether to continue with current treatment or combine it with something else. 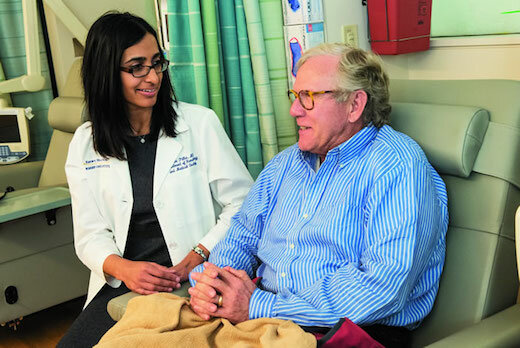 Photo: co-first author Rathi Pillai, MD with lung cancer patient Danny Foshee, originally in Winship magazine. In lung cancer patients who were taking immunotherapy drugs targeting the PD-1 pathway, testing for CD8 T cell activation in their blood partially predicted whether their tumors would shrink. The results were published online by PNAS April 26. This work was funded in part by the National Institutes of Health, the T. J. Martell Foundation and the Maiola Family Fund for Lung Cancer Research.